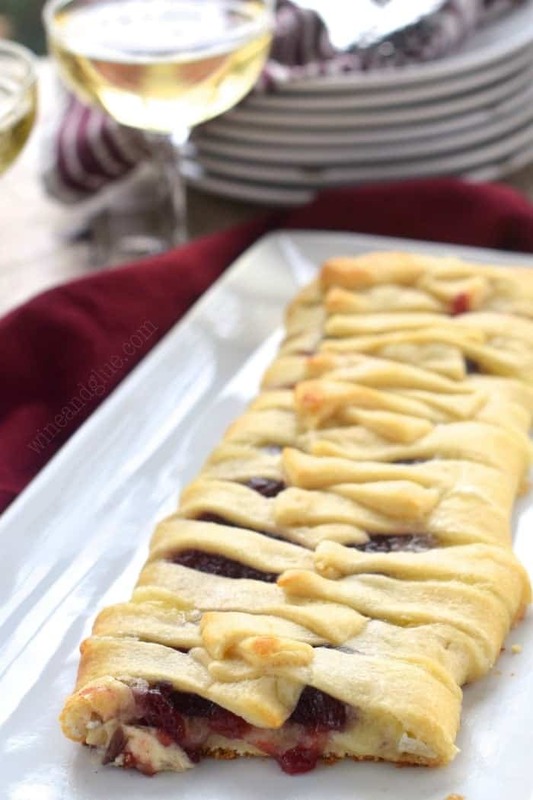 This Cranberry Brie Braid could not be easier, but it is gorgeous and makes for a great fancy appetizer! 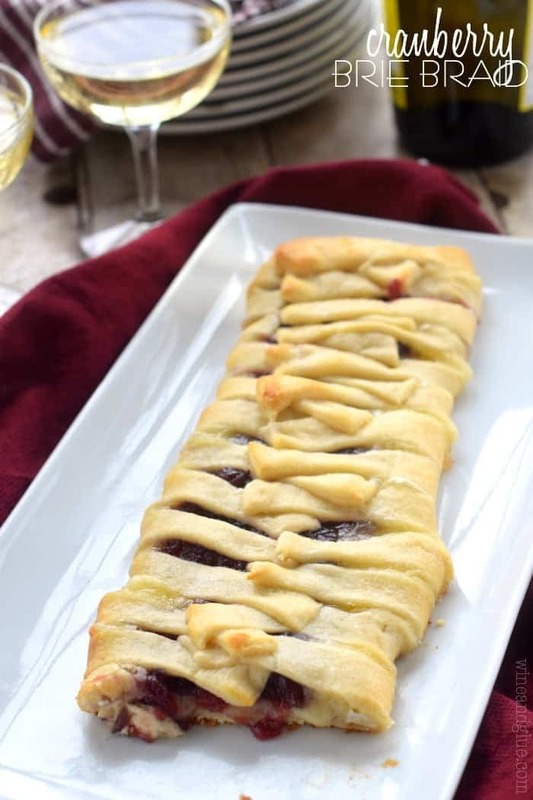 This Cranberry Brie Crescent Braid is the perfect holiday and Christmas baked appetizer! Cranberry and brie go together perfectly in this crescent-wrapped recipe. 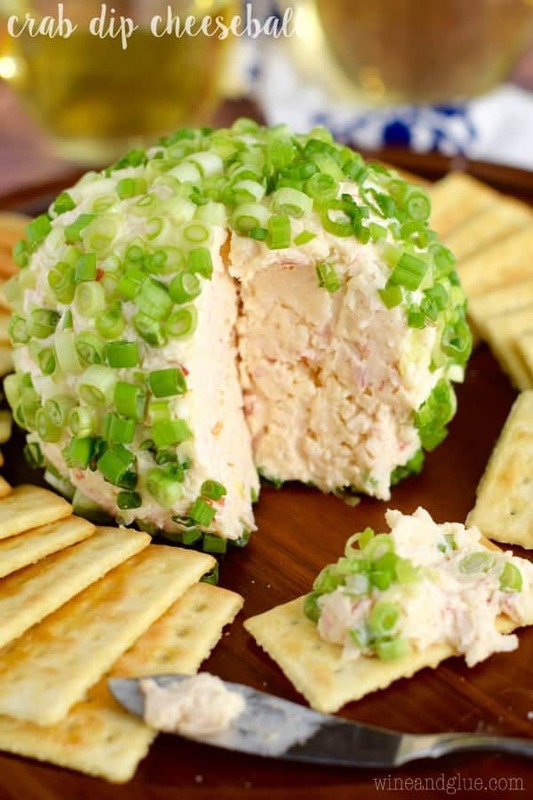 It is like a beautiful twist on baked brie! You could also make this easy baked brie appetizer with puff pastry! If you are looking for more holiday recipes to serve your guests, make this Cranberry Christmas Cake, these Slow Cooker Cocktail Meatballs, this Easy Bacon-Wrapped Shrimp Appetizer, and this Cranberry Orange Mulled Wine. In a few days, I’m going to be rounding up the most popular posts on Wine & Glue in 2014. (You know the posts that got the most page views by readers this year.) I’m kind of excited to see what makes the cut. There are a few recipes that I just know are going to be in there, and the Chicken Pot Pie Crescent Braid is for sure one of them. It’s funny, because it’s a delicious and very fun recipe, but Nathan is always saying, “Really . . . ?? ?” about it’s popularity. 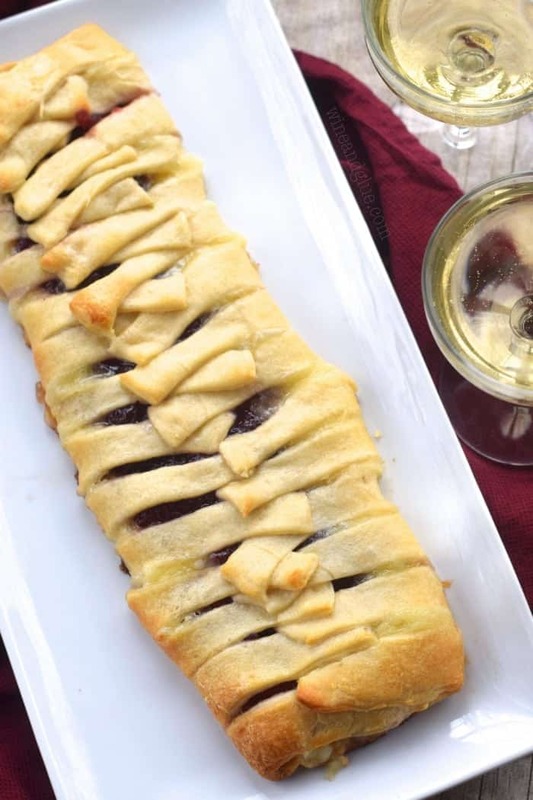 So in honor of the recipe that was the most popular on Wine & Glue this year and in honor of the end of 2014, I decided to make you a really fun appetizer based on the Chicken Pot Pie Crescent Braid sensation! 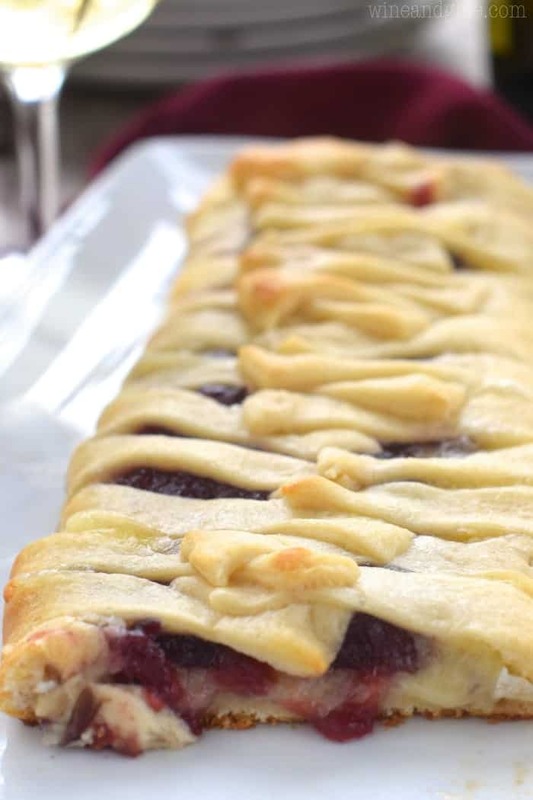 Cranberry Brie Crescent Braid!! This is so super simple, but look how pretty! And absolutely delicious! If you have party guests with more adventurous taste buds, you could change it up and replace the cranberry sauce with Nutella, or dark chocolate, or . . . honey! Or you could just keep it as is, because it is absolutely delicious like this! Cut the brie into thin (approximately 1/4 inch) slices and line it up down the middle of the dough. Spoon the cranberry sauce over the brie. Take a strip of dough from one side and fold it over the middle mixture. Then take a strip from the other side and fold it over the middle. Continue down the dough, alternating sides until it is completely folded over. Bake for 16 to 18 minutes so that the top is golden brown. There will be a decent amount of leaking out from the brie and the cranberry sauce during baking, that is normal. You want to make sure that the dough is baked, but the bottom is not burnt. You can test this by lifting up folds in the middle top of the braid and by peaking at the bottom. After removing from the oven and letting the braid stand, move to the serving tray very very carefully. I used two spatulas and a lot of prayer, and I still had a flop, but I was able to reposition things and still make the braid look beautiful. I am very happy that you gave such great instructions for making this braid. It is gorgeous, impressive and delicious! You specify “3/4 of a container” of brie. What size container are you referring to? I have seen brie containers varying in sizes from 4oz to 24oz. Thanks! Love the combination and flavors here and absolutely love the video tutorial! Stopoing by from the creative collection! Do you thing Pillsbury pizza dough would work? We do not have the seamless crescent rolls in Canada? Kari, I think that it might work, but I would worry that the taste of the dough wouldn’t work quite right. Instead, I would try doing it with puff pastry dough. Do you have that? Just made this and it was great. Easy. Will be part of my entertaining menu in the future! I’m so happy to hear that Cathy! Thank you so much for coming back to comment! You’re welcome! I hope you enjoy Laurie! 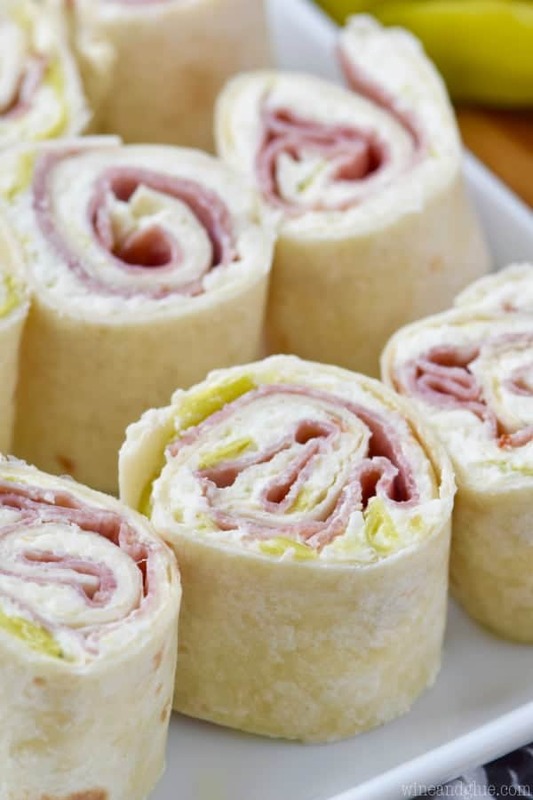 Have you thought of baking this on parchment paper and then sliding it off onto your serving platter? I made this for girlfriends, and it was delicious. Next time I will cut the Brie strips ahead of time and put them In a covered dish until ready to use. I will also measure out the cranberry before unrolling the dough, and I’ll cut strips first, then put pre cut Brie on, then pre measured cranberryon. I say this because after rolling out the dough I then cut the brie into strips and put it and cranberry on and did strips last. The strips were not easy to cut since the dough had been resting so long, and some stretched as I tried to lift them. Nevertheless, it still looked great and tasted great, no changes in recipe! The solid dough strip is so great to use. Thanks for the warning about difficulty plating it. I cooked it on parchment paper on the pan and just cut the paper next to the brie and slid it onto the platter holding to one end of parchment paper. Looked great on my plate. 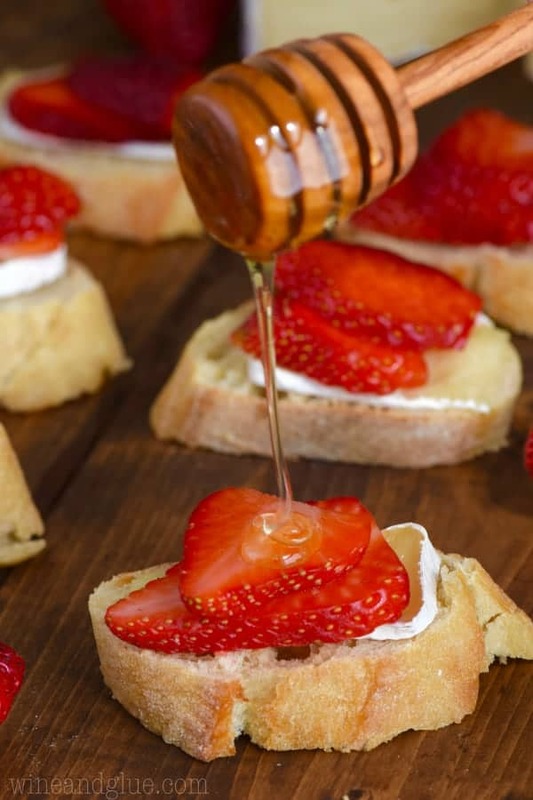 I plan to try this with apricot preserves next time. Can you please tell me if you have ever prepared this this the night before & left in refrigerator to bake for the morning! My concern is the crescent dough, wondering if it will still turn out the same or if it will do anything to the crescent dough from being out of the can overnight! Thanks your quick response is greatly appreciated!! Rhonda, I wouldn’t. The Pillsbury doughs, while a huge time saver, aren’t awesome out of the container for left overs. Like then need to be baked right away and then eaten right away. I was wondering how many “servings” you would say this is? Planning to make it for a MOPS Spa Day for 20-25 women, along with 3 other appetizers and wondering how many to make. Thank you for any guidance you can offer! So I would say that you can easily cut it into at least 8 pieces. Perhaps more. And I wouldn’t count on more than a slice per person. Maybe count a slice and a half or add a few extra slices for those who freak over how good it is. I hope you like it!